Billy performs "Uptown Girl" in Russia. 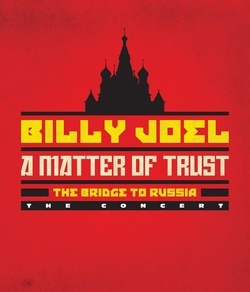 A better quality version of this is on 2014's A Matter of Trust: The Bridge to Russia concert DVD. If it didn't become so popular, "Uptown Girl," might have been known simply as a novelty song, an homage to Frankie Valli and the Four Seasons, and loving tribute to Christie Brinkley. 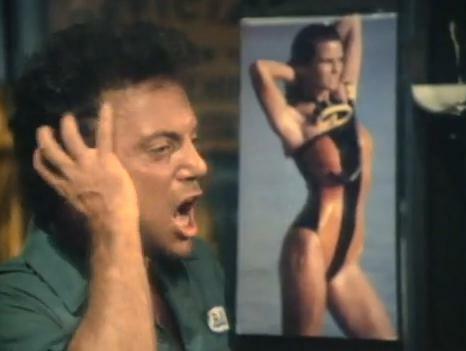 As it is, however, the song became a huge hit and is often derided by Billy's critics as somehow being symbolic of what is "wrong" with Billy Joel, or his fans. The criticism is unfair. "Uptown Girl" is an intentional one-off. It was a deliberate attempt to mimic the Frankie Valli falsetto, and a clever counterpoint to Valli's "Rag Doll." It works both musically and lyrically. In contrast to "Rag Doll," in Billy's song it is the guy who is on the wrong side of the tracks, he is a "downtown man" and is trying to a woo an "uptown girl." Billy accounts himself well in the song. People who don't like "Uptown Girl" don't like Frankie Valli, but "Uptown Girl" is more like Frankie Valli than anything else that Billy Joel wrote. The music video for "Uptown Girl" is a classic. It features both him and Ms. Brinkley doing some simple dance steps. In the video, Billy is a grease monkey at a run-down garage when Ms. Brinkley's limousine pulls in for a fill-up. Billy and his mates begin serenading the uptown girl, and soon she gives in to his working class charms. It was one of the most popular videos of the time as that genre was exploding onto the scene, and no doubt helped propel the song to #3 on the US charts and #1 on the UK charts. Eighteen years later the UK group Westlife did a cover version of the song that went to #1 in the UK. The accompanying video also featured a super model, Claudia Schiffer. The song is no "Summer, Highland Falls" or "Vienna," and would not make my list of top 40 Billy Joel songs, but it works very well within the context of the album. And the music video remains a guilty pleasure even today. "And now she's looking for a downtown man . . . "
Official music video "Uptown Girl"
Billy discusses the inspiration behind "Uptown Girl."